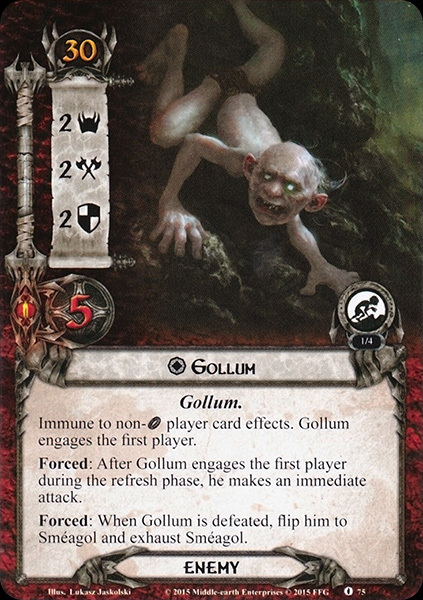 Gollum, also known as Sméagol (OE, pron. [ˈsmæ͡ɑːɣoɫ]), was a creature (originally a Stoorish Hobbit) who bore the One Ring. He lived in the Misty Mountains for most of his life. In T.A. 2941 he lost the Ring to Bilbo Baggins. For the rest of his life he sought to recover his 'precious' 'birthday present'. In T.A. 3019 he followed the Fellowship of the Ring and met Frodo Baggins. After leading Frodo into Mordor and betraying him to Shelob he finally seized the Ring in Sammath Naur. In his euphoria he died and destroyed the Ring after falling into the cracks of Mount Doom. After this event, he started to make a gurgling sound from his throat; for this his family called him 'Gollum'. Sméagol was quickly corrupted further by the ring and, banished by his people, was forced to find a home in a cave in the Misty Mountains. The Ring's malignant influence twisted his Hobbit body and mind and prolonged his life far beyond its natural limits. He called it his 'Precious' or his 'Birthday Present,' the latter as a justification for killing Déagol. His addiction to the Ring was so great that he overcame his hatred and fear of the Sun, the Moon and other creatures. He left the Mountains and pursued Bilbo, but the trail was cold. He made his way into Mordor, where he was captured by the Nazgûl and forced to reveal what he knew about the Ring. Thus Sauron's spies learned from him the names 'Shire' and 'Baggins'. By T.A. 3017 Gollum was then set free, but caught by Aragorn, who turned him over to Gandalf. Gollum picked up the trail of the new Ring-bearer, Frodo Baggins, as he and the Fellowship of the Ring traveled through Moria. On January 15, T.A. 3019 the Fellowship was divided when Gandalf disappeared while fighting a Balrog. Gollum continued trailing the remaining members. It is unknown how he crossed the Bridge of Khazad-dûm, but he came with them to Lothlórien without their knowing. Gollum, floating on a log, followed their boats down Anduin to Rauros. He pursued Frodo and Sam across the Emyn Muil when they struck out on their own towards Mordor. 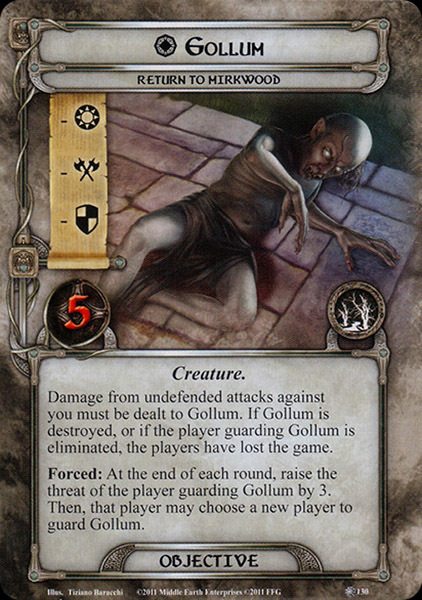 Gollum followed them, but after a confrontation in which he bit and nearly strangled Sam, Frodo subdued him. Frodo tied an Elvish rope around Gollum's ankle for a leash, but the mere touch of the rope pained him. Taking pity on the wretched creature, Frodo made Gollum swear to help them. Agreeing to the oath, Gollum swore by the 'Precious' itself, and Frodo released him. The unlikely company, guided by Gollum, made their way to the Black Gate, the entrance to Mordor. Frodo's kindness brought out the 'Sméagol' personality, and he made at least some effort to keep his promise. The two had a strange sort of bond from both having been Ringbearers; in Gollum, Frodo saw his possible future, and so wanted to save him so he could save himself. 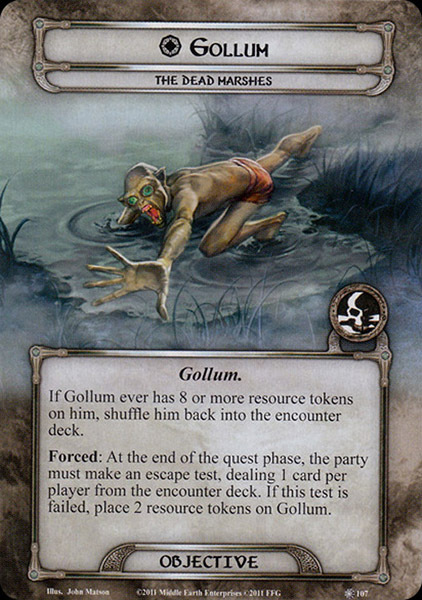 Gollum also feared Frodo, and also thought that helping him would deprive Sauron from the Ring. Frodo and Sam were caught by Faramir, and Gollum followed them. When Frodo allowed Faramir to briefly take Sméagol prisoner, however, he felt betrayed, allowing the 'Gollum' personality to take control. Faramir found out that the place Gollum was taking them was called Cirith Ungol. He then warned Frodo and Sam of the evil of that place. Frodo, Sam, and Gollum left Faramir and began crossing the pass of Cirith Ungol in the border-mountains of the Ephel Dúath. Gollum visited the great spider Shelob, because he was planning to betray the Hobbits to her and then get the Ring for himself. When he returned the Hobbits were asleep. The sight of Frodo sleeping nearly moved Gollum to repent. However, Sam woke up and spoke harshly to Gollum, and all hope of redemption was lost. Gollum followed through with his plan and led Frodo and Sam into Shelob's Lair. 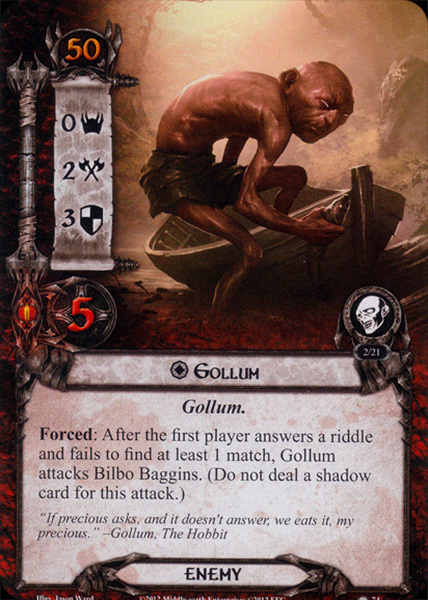 For this service to Shelob, the Orcs of Cirith Ungol knew Gollum as 'Her Sneak'. Just as Frodo warned him, Gollum's betrayal of his oath ultimately led to his undoing, for Frodo and Sam escaped from Shelob's lair and came against all odds to the volcano Orodruin, or Mount Doom. Gollum followed them all the way, seeking a chance to surprise them and take the Ring. When Frodo and Sam had almost reached their destination, he attacked, but failed to get the Ring. Sam, who had hated Gollum on sight, tried to bring himself to kill him, but relented out of sheer pity and disgust, turning his back on the beaten creature. Here Frodo's kindness in sparing Gollum's life was rewarded, for Gollum then teetered on the edge of the great pit, lost his balance and fell in, taking the Ring and finger with him with a last cry of 'Preciouss!'. Had Gollum not lived to play this final part, there would have been a good chance that Sauron would have regained the Ring, as he knew where Frodo was as soon as he put the Ring on. During his centuries of loneliness and under the Ring's influence, he developed a sort of multiple personality: his evil personality was a slave to the Ring and would kill for it, overwhelming his former self, who still vaguely remembered things like friendship and love. Not having anyone else to speak to, he often quarrelled with himself. Gollum both loved and hated the Ring and himself. He often referred both to the Ring and himself as 'my Preciiouss', perhaps confusing the two entities. Years later, Samwise Gamgee would name the good personality 'Slinker' (for his fawning, eager-to-please demeanour), and the bad personality 'Stinker'. Sméagol's (pron. [ˈsmæ͡ɑːɣoɫ]) name is Old English one, from sméah, and adjective meaning 'creeping in, penetrating'. It is etymologically related to the word smials. This title was also applied by the Anglo-Saxons to the Biblical Cain, from the story of Cain's murder of his brother Abel in Genesis. This draws a clear connection between the two. Sméagol is the translation of an actual Westron name Trahald. The meaning of which was 'burrowing, worming in' or 'apt to creep into a hole'. In both Westron and Old English, Sméagol's name is related to Smaug's: Smaug's name in 'true Dalish' was Trāgu, and the Trah- stem in Trahald and Trâgu is thus an analogue of the Germanic stem present in both Sméagol and Smaug. The name Smaug which means 'squeezed through a hole' is thus related. In Tolkien's recordings of The Lord of the Rings he also pronounced it 'SMEE-gol' or 'SMEE-AH-GOL', suggesting that éa should either be pronounced as a long 'i'-sound or as a diphthong ea, and not as two distinct vowels 'e' and 'a'. Tolkien had a habit in his writing to put diacritics in varying places, as can also be seen in the name Eärendil, which also occurs spelt Ëarendil. In The Silmarillion, it is mentioned that the One Ring was found 'ere the Kings failed in Gondor'. 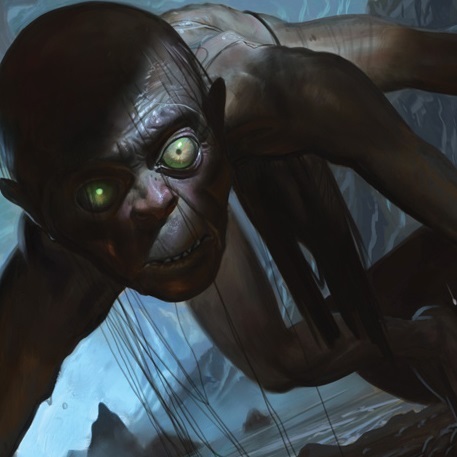 This can mean that originally, Gollum's age was intended to be considerably more than six hundred years (further reinforced by certain places in The Lord of the Rings like Gollum referring to tales about an uncorrupted Minas Ithil or Gandalf comparing his people to 'fathers of the fathers of the Stoors'). In fact it seems likely that Sauron leaving the Mirkwood in 2063 T.A. and some Hobbits settling there after that are details added for the purpose of making the smaller age possible; perhaps in order to make it possible for Gollum and the other characters to have the same language. John Garth has suggested that the character of Gollum carries echoes of the 'night-haunting, man-eating' ogre Grendel in Beowulf.